Benjamin Larson was in his fourth year at Wartburg Theological Seminary in Dubuque, Iowa. (CNN) -- A seminary student who was in Haiti along with his wife and cousin is believed to have been killed in the magnitude-7.0 earthquake that struck the island nation, his family and seminary said Thursday. Benjamin Larson, 25, from LaCrosse, Wisconsin, the son of two Lutheran ministers, was in his fourth year as a master's of divinity student at Wartburg Theological Seminary in Dubuque, Iowa. He was in Haiti, along with his wife, Renee, and his cousin Jonathan Larson, both of whom also are fourth-year seminary students, to help with the new Haiti Lutheran Church, said a statement on the Web site of the First Lutheran Church in Duluth, where Benjamin Larson's mother, the Rev. April Larson, is pastor. His father, the Rev. Judd Larson, is interim pastor at Our Savior's Lutheran Church in Duluth. "Pastors April and Judd Larson wish to share with you ... the profound sorrow with which they are living, and to ask for your prayers," the statement said. The Larsons received a message early Thursday that their son had been killed, according to the statement. Benjamin Larson was teaching at the Pastors and Lay Leaders Theological Conference in Haiti, the statement said. At the time of the quake, the three relatives were staying at St. Joseph's Home for Boys on a mountain in Port-au-Prince, First Lutheran Church said. "During the earthquake, the building collapsed on all three." Renee and Jonathan Larson were able to escape, but could not find Benjamin Larson, the statement said. They had to flee down the mountain immediately. Wednesday morning, Renee Larson and others returned to try to find Ben, to no avail, according to the First Lutheran statement and a statement from seminary President Duane Larson. (He is not closely related to the students). Renee and Jonathan Larson were at the U.S. Embassy in Haiti, and were to be evacuated to the Dominican Republic on Thursday, Duane Larson said. They are expected to be returned to the United States this week, he said. Jonathan Larson, of Red Wing, Minnesota, and his cousin were serving as teachers in the Evangelical Lutheran Church in Haiti for a January term project, Duane Larson said. Renee Larson, originally of Garrison, North Dakota, was doing interviews and research for her thesis on the beginnings of the Evangelical Lutheran Church in Haiti. "Ben was so excited to become a pastor," April Larson said in the First Lutheran statement. "Ben loved Christ and he loved people." In an interview with the ECLA news service, cited by the seminary in a written statement, April Larson described her son as "gentle, in love with Christ, in love with people, in love with life. He's been hearing God's call. His life belonged to God. If you want to know Ben, listen to his music." Benjamin Larson was the youngest of the couple's four children, the seminary said. His name was the first released of an American victim in the Haiti quake. State Department officials said a U.S. Embassy employee also was among the dead, but did not identify the victim, saying relatives were being notified. A seminary classmate, Corrine Denis, cried as she spoke about Benjamin Larson, who she had known since their pre-seminary college days at Luther College in Decorah, Iowa. "A lot of people say, 'He would give you the shirt off his back,' but Ben really would," Denis said. "He'd give you his hat and his socks and whatever you needed." She said Larson led the music team at the college's student-led worship service. "Ben was compassionate to the nth degree," she said. When he was headed to their floor on campus, she said, "You could hear him singing in the stairwell before he got there." He was "full of light, and truly Christ's love emanated from him," Denis said. "He was one of a kind, and we will miss him so deeply." Duane Larson said, "We so grieve with his parents, April and Judd; for Renee's loss of her husband; Jonathan's loss of a dear cousin, for our loss of a beautiful friend. Ben's baptismal light burned so brightly in our community and for all who came to know him. We grieve the loss of so clear a proclamation, with eyes twinkling, of Christ's love, compassion and humor." He told reporters he had known Benjamin Larson for a couple of years before he began studying at Wartburg, and is a close friend with his family. "It's a very personal loss." He said the seminary student had a commitment to spreading God's word in a "healing, musical and compassionate and easygoing way." He said he believed the Larsons had left for Haiti on January 4. Benjamin Larson was a key member of the seminary's basketball team and played racquetball, he said. A family spokesman did not immediately return a call seeking comment from CNN Thursday. A lot of people say, 'He would give you the shirt off his back,' but Ben really would. "He loved God," April Larson told the Duluth News Tribune newspaper Thursday. "He loved the church. He loved people. He was just one of those people that built love and community wherever he was. "He was somebody who loved life, loved living ... a person filled up with joy. He was just a ton of fun." In 2008, Benjamin Larson served as an intern at Our Savior's Lutheran Church in Lincoln, Nebraska. Pastor Lowell Hennigs did not want to comment to CNN Thursday, saying he had not spoken with Larson's parents. In a church newsletter from 2008, however, Hennigs wrote that both Benjamin and Renee Larson were "delightful, outgoing and extremely talented young folks" and musicians. 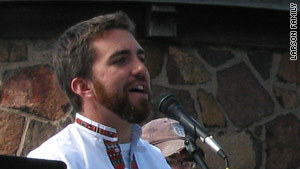 Benjamin Larson composed music and liturgy and played a wide variety of instruments, he said. Rafael Malpica Padilla, executive director of the Evangelical Lutheran Church of America's Global Mission Unit, told the Larsons, "We will do everything [we] can to help find Ben and bring him home," the First Lutheran statement said. A fourth Wartburg student, Sarah Thomson, is safe in Jacmel, Haiti, the seminary said.